With the late-breaking and clinical trial-placeholder abstract deadlines a week away, we thought it was a good time to answer the question: Why should I submit my clinical trial to the AACR Annual Meeting 2015? 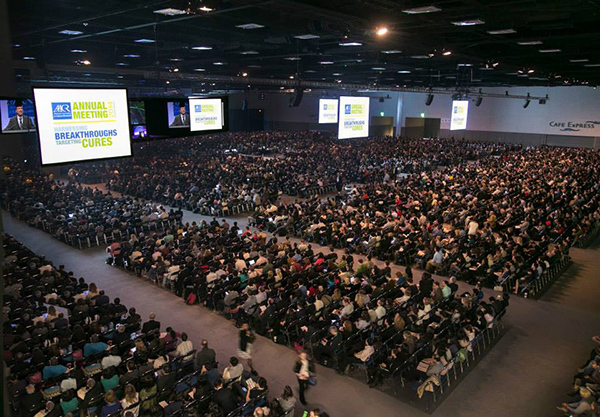 The AACR Annual Meeting brings together more than 18,000 scientists from around the world. The AACR Annual Meeting has long been the “must-attend” meeting for the cancer research community, where cutting-edge science, ranging from fundamental discoveries to clinical advances, is presented to the world. As the pace of scientific discovery continues to increase, the deeper understanding of all aspects of cancer biology combined with integrated approaches to research and novel regulatory mechanisms are revolutionizing drug discovery, and, in turn, the conduct of clinical trials. Central to the recent revolution in clinical research is an integrated approach where all stakeholders actively participate in the discovery, testing, and regulatory process. The AACR is the home for these individuals, and as a result, the AACR Annual Meeting has become a showcase for innovative experimental therapeutics, many of which have been or go on to be designated as breakthrough therapies. During the AACR Annual Meeting 2012 in Chicago, the efficacy of the then-experimental drug ibrutinib (Imbruvica) in treating diffuse large B-cell lymphoma was presented in the opening plenary session by Louis M. Staudt, MD, PhD. In February 2013, ibrutinib was granted breakthrough therapy designation for mantle cell lymphoma and Waldenström macroglobulinemia. In November of the same year, ibrutinib was approved by the Food and Drug Administration for the treatment of mantle cell lymphoma, becoming only the second therapeutic to be approved under the breakthrough designation. Ibrutinib also went on to be granted accelerated FDA approval for the treatment of chronic lymphocytic leukemia in February 2014. The AACR Annual Meeting has become a showcase for innovative experimental therapeutics, many of which have been or go on to be designated as breakthrough therapies. Similarly, the correlation between biomarker positivity and efficacy of the experimental immunotherapy pembrolizumab (Keytruda), formerly MK-3475, in the treatment of both melanoma and non small-cell lung cancer (NSCLC) was reported in two separate presentations at the AACR Annual Meeting 2014 in San Diego. A year before these presentations, the FDA designated pembrolizumab as a breakthrough therapy for the treatment of melanoma. In October 2014, the FDA again designated pembrolizumab as a breakthrough therapy, this time for the treatment of NSCLC. 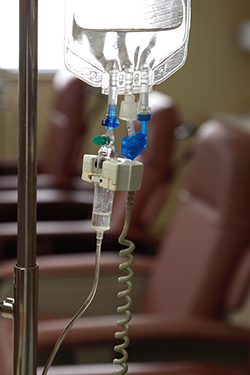 In September 2014, as highlighted previously on this blog, the FDA granted accelerated approval to pembrolizumab for the treatment of melanoma, and it is anticipated to do the same for the treatment of NSCLC before the end of 2015. In addition, the efficacy and toxicity management of 19-28z chimeric antigen receptor T cell therapy (JCAR015) in B cell acute lymphoblastic leukemia was presented during one of the four clinical trials symposia held during the AACR Annual Meeting 2014 in San Diego, California. Due to its amazing promise, the FDA granted JCAR015 breakthrough therapy in November 2014. Have your clinical trial become a part of the legacy of cutting-edge clinical research presented at the AACR Annual Meeting by submitting your clinical trial or clinical trial placeholder abstract by Jan. 27. If you will have a peer review-ready manuscript prepared for submission to one of the four clinically relevant AACR journals by March 2, take advantage of our new opportunity for simultaneous presentation and publication of your abstract and manuscript, respectively, if accepted. If you have previously presented your clinical trial, but have significant new data to present, we want to give you the opportunity to tell everyone; simply follow the prompts during abstract submission and supply a copy of the previous abstract.